TO ALL THE FATHERS who serve their country...your honor and courage are a lasting legacy for all our children. Your sacrifice ensures their future. TO ALL THE FATHERS of children in prisons...you are the earthly example of God's unconditional love. In whatever way is safe and appropriate, never let them forget that you love them. TO ALL THE FATHERS who are in prison...your life can serve as a warning to your children AND an example of God's grace and forgiveness. You choose. You will always be the father. What would you have your children learn from you? TO ALL THE FATHERS whose children have died...you will always be their father. The pain you endure as you grieve their loss honors them. You are a living memorial to their memory, never letting others forget. 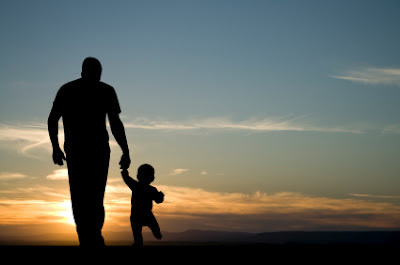 TO ALL THE FATHERS who have been bad fathers by the world's standards and God's...there is forgiveness, restoration, and reconciliation in Christ. Don't wait. Now is the time. Today is the day. TO ALL THE FATHERS who parent alone...your courage is inspiring. You keep going even when you are scared and clueless because your children need you. They will never forget. TO ALL THE FATHERS who now see the wisdom of your own fathers...give thanks for them and ask for God to bless them. TO ALL THE FATHERS who are not perfect...teach your children what it means to be humble. Let them learn how to say they're sorry by watching you. Let them learn to forgive others because they have learned to forgive you. TO ALL THE FATHERS who are alone on Father's Day and others...you are still the father, even when you are away from your children. Pray for them. God is the Master of relationships. He will show you how and make a way. TO ALL THE FATHERS who hit their knees daily in prayer for their children...thank you for standing in the gap for them. You understand. TO ALL THE FATHERS who teach their sons to be godly men...you bless not only your own child, but the next generation as well. TO ALL THE FATHERS who love their daughters and show them their worth...you protect them and make them strong. Thank you. TO ALL THE FATHERS who love their children's mother well...you give them an example of God's love for His children, instill in them security and peace, and set an example for future generations. TO ALL THE FATHERS who love God first and best...you get in right. Thank you.